Oscars are freshwater fish, a type of cichlid. If you plan to cultivate and keep Oscar fish in your aquarium, you will find them to be very amusing species to keep in aquariums and tanks. So, before you keep them, you should learn perfect tank setup for your fish. Oscars are popular freshwater species of fish, well known for large size and their dog-like personalities. keeping Oscars in home aquarium is indeed very joyful but providing them with proper tank setup is also very important to let them thrive in a perfect living conditions. So, you should try to set up a tank similar to their natural habitat for their full healthy life. Learning some points will help you setting up a perfect tank for your fish. Oscars generally do not get stressed or feel lonely if kept alone in a tank as they can live happily on their own. Also, because of their large size, they need sufficient large tank space to do well. Still, you can buy tank mates for your fish but you have to take care of things while you do this like buy a fish that is shy, timid, bottom-dwelling and larger than Oscar’s mouth in size. Oscar tank mates may be catfish, Firemouth cichlids, Silver Dollar fish and blue acara. Right tank conditions ensures happy and healthy fish you always want to see. So, cultivate your fish with perfect living conditions in the aquarium water tank. Temperature should be between 77Â° and 80Â°F and pH level between 6 and 7.5 is perfect. Oscars are habituated to rearrange their tanks. So, decorations size should be large enough so that fish can’t move them. Heating is also very important in Oscar tank. Since Oscars are tropical fish, they need warm water. Therefore, your Oscar fish tank should have a good quality aquarium heater. Oscars grow up to 10 inches and a 50-gallon aquarium will prove to be very small for 2 adult fish at this size. Keeping Oscar fish for a very long time will mean, providing them with enough large living space to thrive in as they grow large, very quickly crossing your assumptions. Let your Oscar fish enjoy their natural dim and murky environment with aquarium lighting. You also need lighting for live plants in the water tank. Aquarium cycling is very important for setting up freshwater aquarium for your Oscar fish. This process takes 6-8 weeks. Oscars are known for their messy trait. The messy type trait is due to their large size and therefore, produce significant waste that results in high levels of ammonia and nitrate in the tank. So, tank must have a good quality filtration system and you must change tank water regularly to maintain water quality. Chemical filtration removes ammonia and nitrite. Safe amount of ammonia or nitrite levels should be maintained at zero level as they are toxic to fish. When ammonia, nitrites and nitrates level is zero in tank, your water tank is fully cycled. You should also never forget to maintain optimum level of water temperature and pH. After the cycling process of 6 to 8 weeks, you need to introduce your Oscar fish into the water tank from plastic bag you bought from the fish store. Start by floating plastic bag in your water tank to make the water temperature of bag and tank water as same. It takes 20 minutes of time and then you can add your fish in a water tank by acclimating your fish to pH level of water tank. Ammonia and Nitrites Levels should always be maintained at zero level in case of Oscar fish water tank as these chemicals are toxic to your fish. Due to the waste released from Oscar fish, ammonia and nitrites cannot be at zero level as waste contribute nitrates and hence, water tank needs some filtration system to set zero levels. Levels should strictly be zero because their deviation from zero value may result in death of your fish. As you already know that significant amount of waste is released by Oscars and can result in repetition of cycling process if no filtration system is used to remove waste or you are not changing water everyday. Oscar looks cute, sweet and appealing wiggling its nose in the water tank when you buy it from a local fish store. This is when you buy Oscar of about 1 to 2 inches long, but unfortunately it grows up into large, mean cichlid surprising you while they swim across the entire tank with some catfish in the corners of your water tank. If you succeed in understanding their nature, you will have a great Oscar fish in your home aquarium. When talking about their varieties based on coloration, you can have varied varieties of Oscar fish in red, albino coloration with variation in long fins. Though they differ in colors, but they all are same in terms of their feeding choices as they prefer meat either in the form of frozen food or pellets. They never prefer live foods and feeding them with live foods like guppies or goldfish is not a good idea as they can transfer and introduce diseases within Oscar fish. Oscar eats large amounts of food. So, they make a real mess producing a considerable amount of waste in the tank and hence, requires a canister filter for filtration process. Breeding process is easy as long as a female is not killed by male. Oscar fish tank size in gallons, varies as per their size, but in the general case, it is minimum 55 gallons for a single fish which is typically about 10 inches in length in captivity. 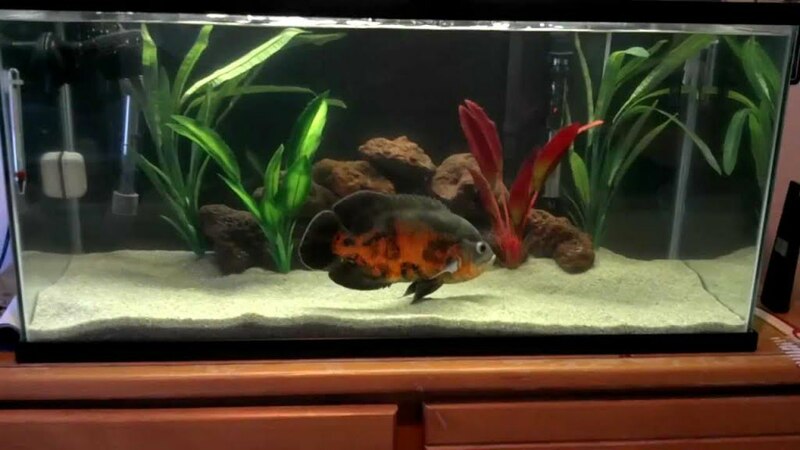 In perfect cases, best size should be 75-gallon for one adult Oscar fish. Capacity increases with increase in number of Oscar fish to be kept. For more than one Oscar fish, at least 100 gallon capacity water tank is needed.